Mature males have more vivid colours in spawning season. 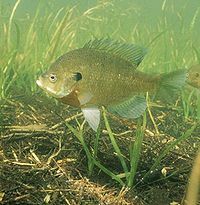 Bluegills are unfussy eaters, they should be fed high quality pellets or flake and supplemented with foods like bloodworm, shrimp, earthworms, crickets and wingless fruit flies. May also accept some vegetable material. These are shoaling fish, in the wild found in groups of 20-30 or so. A dark blue or black "ear" on an extension of the gill cover called the opercular flap and a prominent dark blotch at the base of the dorsal fin, close to the tail. They have typically olive-green backs, with a blue or purplish sheen along the flanks and faint vertical bars may be present along the sides. Breeding males may have more blue and orange colouration on their flanks.